You are currently browsing the archives for the General Recycling category. Commonly referred to as Styrofoam, a trademark of Dow Chemical, foam #6 is also known as polystyrene foam, expanded polystyrene, EPS, and foam. Since its light weight helps reduce shipping costs and its excellent cushioning properties result in less breakage, foam #6 is widely used to protect electronics during shipping. Similarly, it is the material of choice for egg cartons, fast food take-out containers, foam plates, and foam cups because it is lightweight, insulates well (maintains temperature), and is inexpensive. Another benefit of this material is that it is recyclable. In fact, foam #6 is a thermoplastic, so it is technically recyclable over and over again. So why isn’t it being accepted in many community recycling programs? There are several reasons. First, it is not a significant portion of the waste stream. All foam #6 represents less than one percent of all products generated, by weight, in municipal solid waste. Second, waste diversion goals are typically measured by weight, so the lightweight of foam makes it unattractive (a truckload of loose foam only weighs ~1,000 lbs). Third, it takes more effort to collect a pound of foam than a pound of glass or cardboard. So why should we recycle foam? First, foam has real value once it has been compacted. There are now many markets for foam and the price they pay often exceeds the price of cardboard and other popular recycling commodities. Second, new technology has made recycling foam much more efficient than in the past. For example, there are now many options for special compactors, called densifiers, that will compact foam to as much as an 85:1 ratio. This enables 40,000 lbs of material to fit on a 48’ trailer. The equipment also requires less space than in the past and it is able to efficiently process mixed densities of foam at the same time. Plus, it does all of this while minimizing the amount of labor foam recycling may have taken in the past. And third, the conversion of foam into new products is a simple process that reduces the need to harvest crude oil from the earth and all of the energy associated with the process required to make virgin resin. The end result is that we realize a reduction in greenhouse gasses and lessen our dependence on foreign oil. Reclaimers simply place the compacted material into a grinder, which feeds an extruder. The extruder is similar to a Play-Doh machine in that the ground material goes into the machine, melts, and comes out the other end like spaghetti. The spaghetti is then cooled and chopped into small pieces (pellets). Once it is in the form of pellets, it then can be used to make useful new products. Because of these reasons, efforts continue to be made to expand the capabilities to recycle foam. There are companies, like Dart Container, working to make foam recycling more accessible to more people. They have even created positions within their business solely focused on generating new foam recycling programs across the country. And much progress has been made. In 2007, only one city in California participated in a curbside recycling program. Fast-forward to today, and you’ll find curbside Styrofoam recycling centers in over 65 California communities – when the population of these communities is added together, it is more than 20 percent of the state! More and more residents are gaining additional foam recycling options. For instance, there are a number of drop-off locations and collection and shipping programs for those who use large amounts of foam like quick service restaurants, and college campuses. Even school districts are getting involved by collecting students’ foam lunch trays for recycling. All of these programs demonstrate a growing trend of recycling programs that has resulted in reductions in landfills and a more sustainable environment for all of us. We encourage everyone to get involved in recycling foam. To find out where foam can be recycled near you, or to see if your neighborhood participates in a foam recycling program, check www.1800recycling.com, www.earth911.com or http://www.dart.biz/recycle to see if you’re living in, or near a community with a curbside recycling or foam drop-off program. Hello! The NEW Recycling for Charities blog is now re-open for business! Everyone is welcome to submit an idea for an article and if you are interested in being a guest blogger on RFC, then please email info@recyclingforcharities.com. Be sure to include your writing background, ideas and thoughts on recycling in general and the environmental effects that you would like to help educate people on. We are very excited and open to hear your comments and suggestions! Recycling for Charities could not have asked for a better day to celebrate the 40th Anniversary of Earth Day. The sun was shining down on their eco-friendly Smart Car; the newest hits provided by 98.7 AMP Radio kept everything upbeat and the donations pouring in. The campus of Oakland University was glowing green thanks to students, staff and local community members. Interested overseers hung out during set up and engaged in conversation about various green facts and how to help maintain our Earth with volunteers from Recycling for Charities (RFC), Sustaining Our Planet Earth (SOPE), Reverb and The Salvation Army. From 11:30 a.m. until 1:30 p.m. there were several tables stationed outside of the Oakland Center that provided food, key chains, pins, green facts, seeded pots, and activities. Students, staff, and members of the community had the opportunity to donate their broken/old phones, iPods, cameras, electronics and clothing. All donors were entered in a drawing for eco-friendly prizes. Recycling for Charities raffled off a Kodak Digital Camera and a Digital Photo Frame. The winner of RFC’s raffle will be announced and contacted sometime next week. 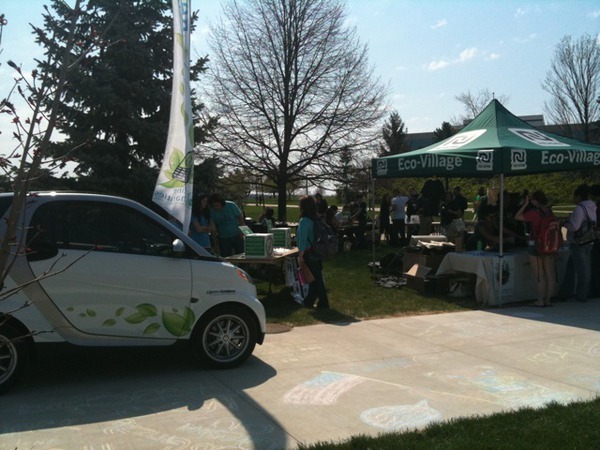 The Earth Day Celebration helped RFC keep 50 tons of e-waste out of landfills. Also, the raised funds were donated to the Michigan Hospice. The Salvation Army walked away with bags upon bags that will help clothe our community and Reverb promoted their Campus Consciousness Tour encouraging students to actively go green. Green gardens will be growing this spring too as the biodegradable pots provided by Bethel Farms and planted with seeds from Siegers were a big hit! The teamwork from all organizations combined to create an exciting, fun and educational environment. If you thought you missed out on the fun, think again! We will be in Downtown Royal Oak this Sunday, April 25, from 12 p.m. until 4 p.m. continuing the celebration of Earth Day with Recycle Royal Oak. Bring your e-waste! You can also stay updated about our green initiatives and events by following us on Facebook and Twitter. Trying to find a way to make your garden even greener this season? Then it is time to ditch those plastic planting pots that usually end up in landfills anyway and start thinking biodegradable! No Glues. No Binders. Nothing Artificial. This is how DOT Pots™ describes its unique gardening products. For them, what the pots are made of is just as important as what they aren’t made of. The biodegradable pots are created solely from all natural wood fibers, 80% spruce fibers and 20% peat moss, which are harmless to the environment. The pots, available through Bethel Organics, are the first and only 100% organic, biodegradable plantable pots in the world! We know biodegradable is a fancy word that is being thrown around a lot in the ‘green’ world today, but what does it actually mean for your garden? Before it has dissolved into the earth, the walls of the pot retain water so that less water is needed. The plant roots, which grow even stronger in the DOT Pots, then easily grow right through the bottom of the pot when they have developed enough. For those of us who have trouble with transplanting, these DOT Pots will be your saving grace. The entire pot is placed in the ground once the plant is ready to upgrade to a bigger amount of soil, so you won’t lose nearly as many plants to transplant shock. The EPA has reported that only 3.9 percent of plastics are recycled each year, which means our landfills are being filled with tons of waste that could be avoided. And this waste is anything but good for our environment. Most plastics, especially those made many years ago, contain chemicals that are released when the plastic is put in a landfill or littered. These chemicals can eventually seep into groundwater and become a health risk to both wildlife and humans. Using biodegradable pots like the DOT Pots helps keep those pesky plastic flower containers from being made, and ultimately from being thrown in landfills. Stronger plants, environmentally friendly, no clean up necessary, and no waste created. 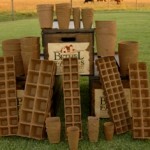 Why wouldn’t you choose DOT Pots for your next garden project? For more information on these pots and to find out where they are sold you can visit DOT Pots or Bethel Organics. Recycling for Charities would like to thank Bethel Organics for their extremely generous donation. The donated DOT Pots will be used as eco-friendly giveaways at our upcoming Earth Day events where RFC hopes to educate the community about the importance of recycling e-waste.